Rarely do I give a failed Internet-based recipe a second chance. There are simply too many other recipes to try, and unless I can point to something I know I did wrong (it happens), I’ll usually just write off such failures as lessons learned. Roasted chickpeas, though? I WANTED the roasted chickpeas to work. So when the first batch came out half-crunchy and half-mushy a couple of weeks ago, I knew I had to try again. The few (very few) roasted chickpeas that were roasted to perfection were ROASTED TO PERFECTION. They were tiny, crunchy bombs of flavor. The original recipe called for what seems like A LOT of olive oil: 1.5 tablespoons for one can of chickpeas. I was left with oil oozing around on the parchment paper beneath the coated chickpeas. My oven can be somewhat unpredictable. It will bake three tiny loaves of zucchini bread to utter perfection within the recommended recipe time, or it will take twice as long as it should to bake a pan of cookies. And sometimes it’ll burn those cookies on the bottom without leaving a hint of gold on their pale little tops. So, less olive oil and more time in the oven seemed to be in order. Also, I decided to add the seasoning BEFORE roasting, since, in theory, perfectly roasted chickpeas would be dry to the touch and wouldn’t allow the seasonings to stick. A word on the seasonings: You can use anything you like. I used Tony Chachere’s Original Creole Seasoning. I’m not sure why you would use anything else, but I imagine Greek seasoning would also work. Crafty Kristen recommends a teaspoon or two of cracked black pepper and a generous sprinkling of sea salt. This batch turned out perfectly — even the biggest chickpeas roasted to crunchy perfection. Preheat the oven to 400 degrees (I might go up 25 degrees next time). 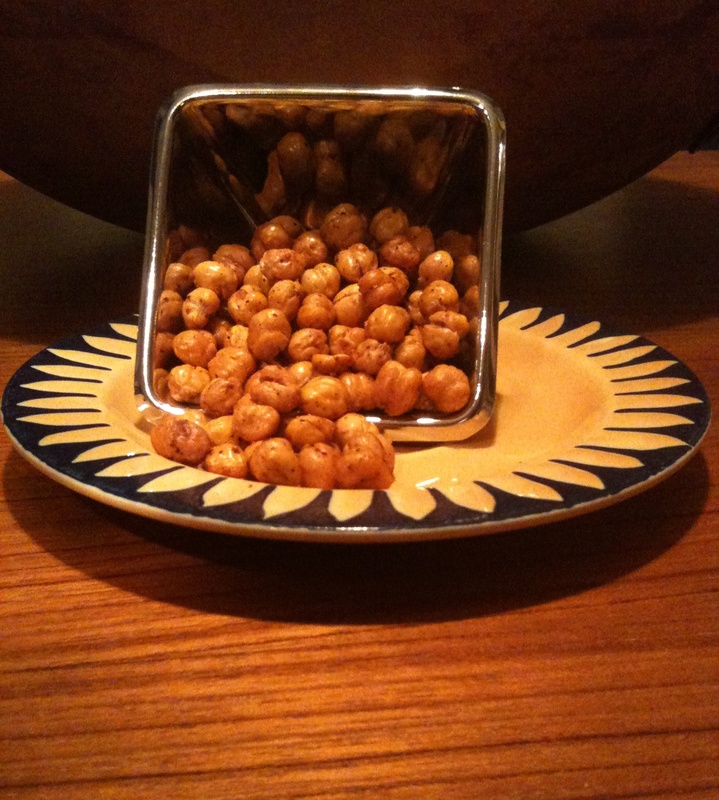 Drain the chickpeas in a colander and rinse with water. Rub the chickpeas, a couple of handfuls at a time, between two paper towels to loosen the thin skin on them. Remove the skins until you get tired of removing the skins, then move on. Your roasted chickpeas will be delightful with or without the skins. Spread a piece of parchment paper out on a baking sheet. Or don’t — hey, I’m not washing your dishes. Spread the chickpeas out on the parchment paper. Put a little olive oil in your hands and coat the chickpeas lightly — you want just enough oil to allow the seasoning to stick. Sprinkle on the seasoning. Less is likely more. Steamy Kitchen’s original recipe said to roast the chickpeas for 30-40 minutes, but my oven took more like 50 minutes. Stir them around about halfway through. The chickpeas will turn a deep golden brown when they’re done, but the best way to check for doneness is to grab one of the bigger ones, cool it off for 30 seconds and eat it. If it’s crunchy, you’re in business. See, that’s the thing: I HAVE used an oven thermometer, and it reads the right temperature. I frankly have never gotten along with this stove. The ceramic top (breakable) makes me nervous, and the oven pushes air around all the time even when I don’t have the convection function turned on (and I don’t even want to talk about convection oven math). I miss my crappy gas stove. It was predictable if unimpressive. I saw this one on pinterest a while back and it is pinned to my recipes to try board. Looks like it is bumping up closer to the top of the list! It’s always to nice to read a first hand report / review. By the way, one thing missing from this review is a report on whether or not this second attempt succeeded. I’m guessing it went well? Eek … where did that sentence go? Yes, it was a huge success. Even the biggest chickpeas turned out crunchy and delicious. Convection ovens simply circulate the hot air with one or more fans, making foods cook more quickly and, in theory, more evenly. BTW does it bother you that they’re called “chickpeas” rather than simply “peas”? Ha ha. Clever. The chickpea/garbanzo bean conundrum is weird. If you look at the bean, it resembles the head of a chicken with a little beak and all. That’s how it got its name. It’s not a pun as to the beans belonging to female specie.